Discussion in 'Dell XPS and Studio XPS' started by miXwui, Apr 17, 2017. I believe the main issue is not due to heat. 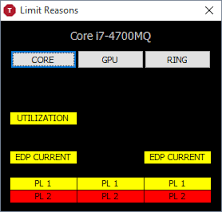 I've read countless threads on here and Reddit pointing to the VRM getting too hot, and thus causing throttling, which I don't think is the main cause. 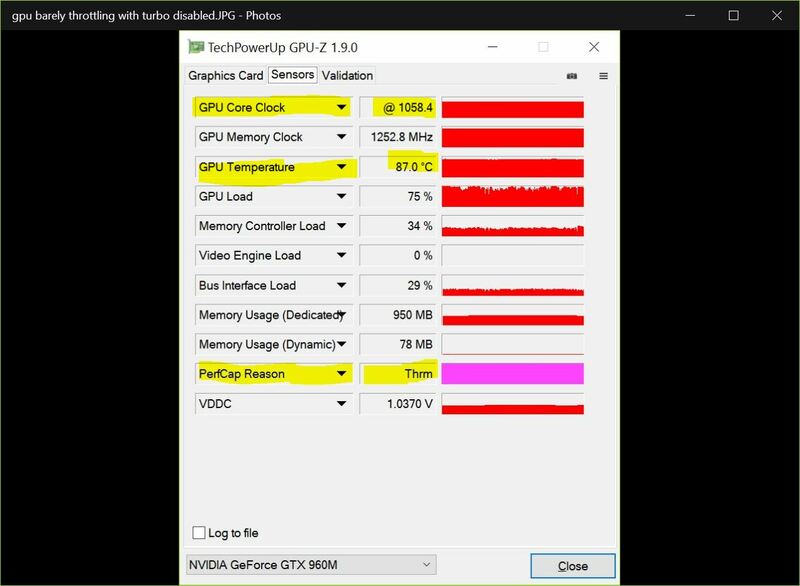 Yes you're right, I should rephrase -- high VRM temps do cause DPTF to throttle because it's super aggressive, however it's almost impossible to keep cool temps with concurrent heavy cpu/gpu usage (i.e. Overwatch) so that's why I disable it. While playing Overwatch in exclusive fullscreen mode, framerates remain well. However, while playing in borderless fullscreen mode, I believe with the increased stress in having to process the Windows desktop, thermal throttling occurs, and the clock speed/TDP will steadily drop until 6-7W/800mhz and remain there until Overwatch is closed. I believe that before a GPU repaste, my 960m was getting throttled as well, but not sure if it was the repaste that fixed that issue or driver updates etc. 1. Did cpu/gpu repaste many months ago (not sure if necessary, but helpful in keeping temps down), used Arctic Silver 5 and some thermal pads I bought from Amazon, use whatever you'd like. Right now applying it through Throttlestop, but I like Speed Shift improvements so much that I may use the more permanent option. Note: @Eason makes a good point, proceed at your own risk. My only concern is that if you didn't do a good repaste and VRM padding you have a chance to actually damage some components. 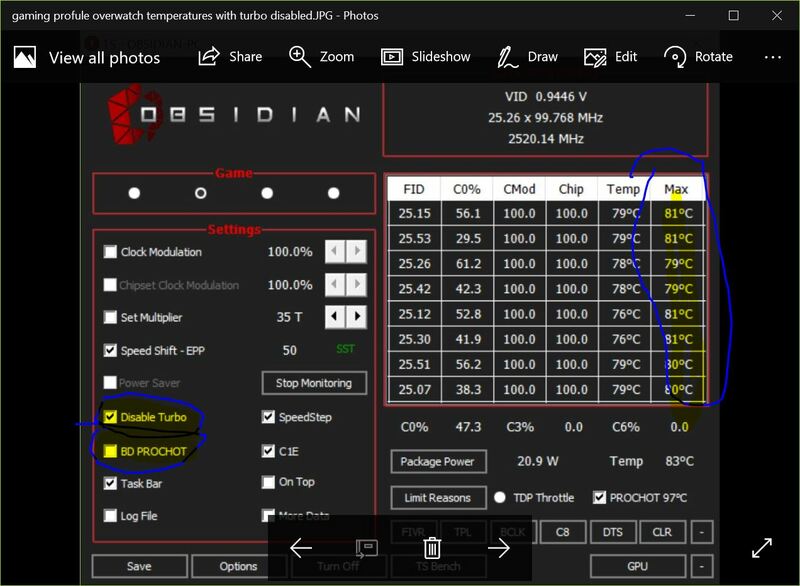 I am reasonably confident in my paste job and temps (plus I use TS to keep temps under control) but if you did this on a totally stock XPS 15 I reckon you'd fry something. (I would make sure you disabled wifi/are disconnected from the internet so Windows doesn't try to reinstall after you uninstall.) I also uninstalled Intel Dynamic Platform and Thermal Framework from my Programs (Uninstall Programs under Control Panel). 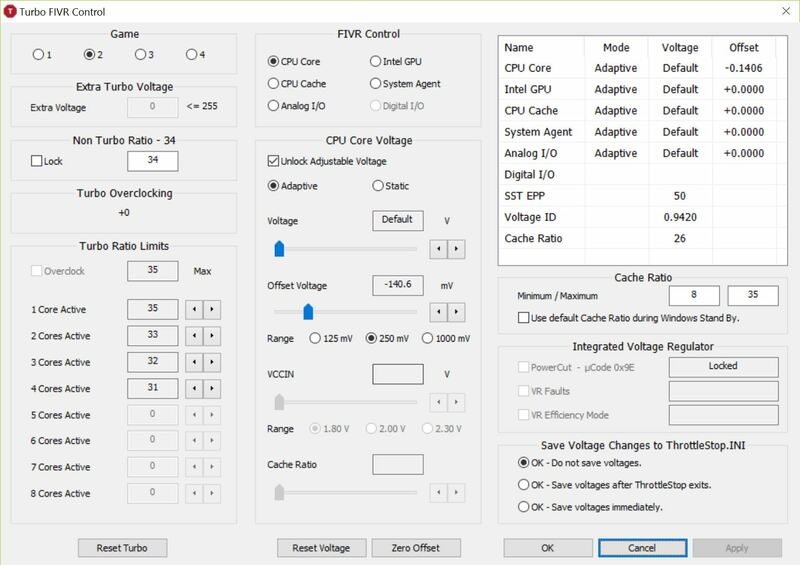 You don't need your cpu turboed at 3.2ghz, 2.6ghz is fine. I now have a Throttlestop profile dedicated to disabling Turbo during gaming. Keeping Turbo on will cause the cpu to be 90C+, and my gpu will reach 90C as well and keep throttling, steadily lowering the gpu core clock to compensate. 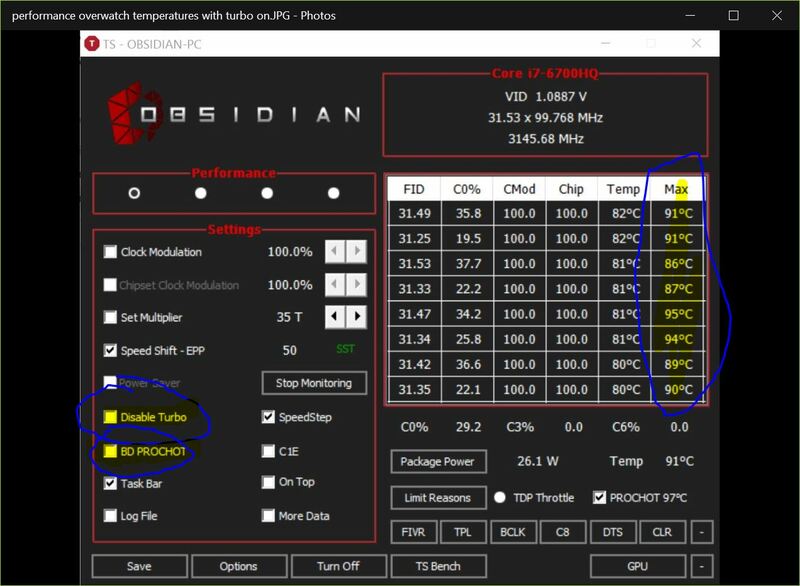 Disabling Turbo keeps my cpu at ~80C, and my gpu at ~87C. "==> Bumped "turbo boost power max" to 65 watts (from 55 watts). That 65 watts shows up in HWiNFO64 also. ==> Also increased the "turbo boost power time window" to 96 seconds. ==> These settings seem persistent as they stick in registers even after several weeks of shutdowns." 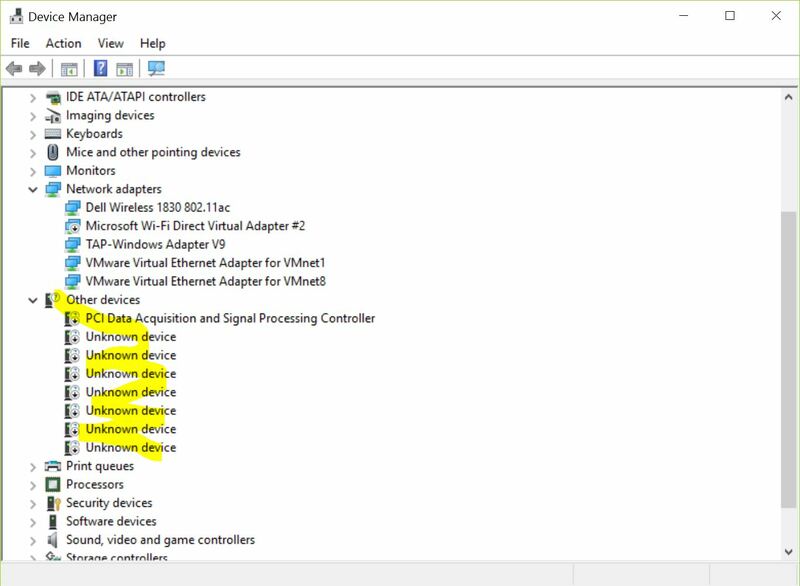 Under Device Manager, under Firmware, right click System Firmware > Update > Search Automatically. Apparently this is supposed to pull the updates from the new BIOS? I've never done this before, but read it somewhere so that's what I did lol. JoeXPS, Jeremiah Tay and custom90gt like this. Yeah, no, it's the VRM temperature that causes DPTF to throttle. I tried to remove DPTF before, but it kept reinstalling itself. Are you sure turning off wifi fixes it permanently? It won't just reinstall immediately? When I was still connected to internet, Windows immediately reinstalled DPTF right after I uninstalled it. Turning off internet prevented this -- Windows Update shouldn't reinstall it either since they're disabled. Right, so you're saying you have to stay offline for it not to reinstall?